Liquidity ratios: Quick ratio, Cash ratio. Each ratio has its own value and provides specific information. This paper will less focus on how to calculate the ratios, but more on which kind of information they provide about a firm. In addition, examples will be given on how to leverage the different ratios. It should be mentioned, that there is a large variety of ratios. This paper will focus only on the ones mentioned above. Liquidity ratios are used to measure the ability of a company to meet its short-term obligations (Gallagher & Andrew, 2007). They take into account the current assets and current liabilities. These ratios are especially important, because failure to pay obligations can in the worst case lead to bankruptcy. Bankers, investors and other lenders use these ratios to judge if they extend a (short-term) credit to a firm. The higher the ratio, the more able is a firm to pay its short-term obligations (Gallagher & Andrew, 2007). Two frequently used liquidity ratios are the quick ratio and the cash ratio. The quick ratio measure a company’s ability to meet its short-term obligations with its most liquid assets (cash, marketable securities, accounts receivable). Therefore, it excludes inventories from current assets (Investopedia, 2016), because they generally take time to be converted into cash. It measures the dollar amount of liquid assets which is available for each dollar of current liabilities. Thus, a quick ratio of 1.8 would mean, that a company has 1.80$ liquid assets to cover each 1$ of liabilities. The higher the quick ratio is the better is the company able to pay off its liquidity. The cash ratio is a more conservative measure to create evidence that a company is able to pay off its liabilities in a very short term (Bragg, 2012). Instead of taking into account all marketable securities and accounts receivable like in the quick ratio, the cash ratio only considers cash and short term marketable securities. Just like the quick ratio, the higher the cash ratio is the better is the short-term ability of a company to pay off the liability. Example: A CFO is concerned that some liabilities may have not been paid on time. The cash ratio is calculated to determine whether the company has the wherewithal to meet its obligations. After calculating a cash ratio of 0.9 (=90%) the CFO realizes that the company is very close to pay all its obligations by cash and short-term marketable securities. Now a decision can be made on whether the company needs to sell any accounts receivable to meet its obligations. Companies rely on two primary sources to finance their operations: owner’s equity and debt. A too high debt structure can be dangerous for the company, as it can lead to credit downgrades or even worse (Investopedia, 2016a). Financial leverage ratios provide an indicator of the long-term solvency of the company in regards to its debt. Unlike liquidity ratios, financial leverage ratios measure to which extent the firm is using long term debt. 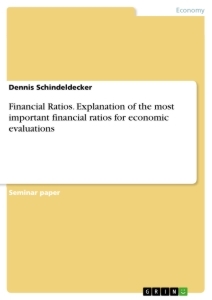 Financial leverage ratios are primarily used for economic analysis and by policymakers. The long-term debt ratio is calculated by dividing a firm’s long-term debt by its total assets. Since the current liabilities are excluded, this ratio provides good insights into the firm’s debt management policy (Baker & Powell, 2005). If a business has a high long-term debt ratio, it indicates that the business has a relatively high degree of risk. This can indicate that eventually the business may not be able to repay its debts. Lenders and investors use this information to decide how risky their investment is (Investopedia, 2016b). Higher long-term debt ratios make lenders and investors more skeptical about loaning / investing money to the business. In contrast, if a business has a low long-term debt to asset ratio, it shows the relative strength of the business. The times interest earned ratio calculates how many times a company’s operating income (EBIT) can settle the company’s expense. A higher times interest earned ratio indicates that the company’s interest expense is low relative to its EBIT which indicates better long-term financial strength, and vice versa. Every time a creditor lends money to a company, he assesses the likelihood of its repayment in principal and in interests. The times interest earned ratio assesses whether the company is earning enough to pay off the associated interest expenses. Therefore, a higher value of this ratio is favorable as it shows if the company has enough earnings to pay off interest expenses. An example for this ratio could be an investor or bank to check the likelihood (and with that the risk) of repayment of its credit or invest. The post-financial crisis macroprudential regulatory policy and the future of banking. Back to a public utility?